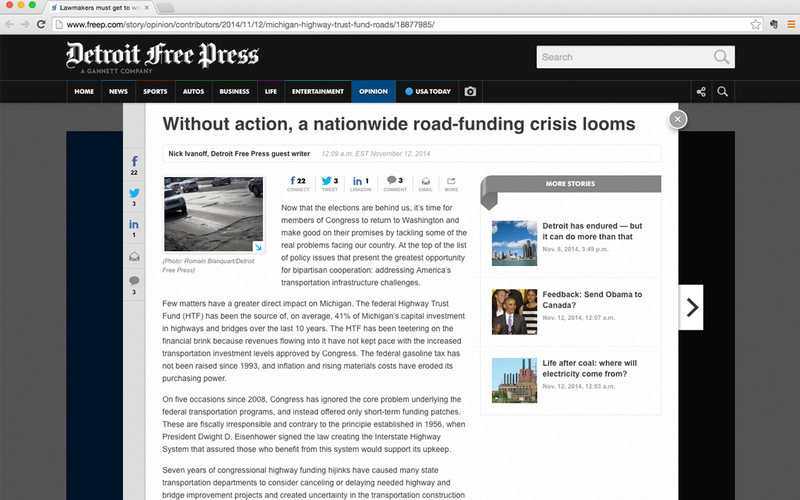 The op-ed placements, in some cases jointly bylined by ARTBA’s state contractor chapter CEO, are the latest effort through ARTBA’s “Transportation Makes America Work” program to keep pressure on lawmakers to address the latest Highway Trust Fund crisis. “At the top of the list of policy issues that present the greatest opportunity for bipartisan cooperation: addressing America’s transportation infrastructure challenges,” Ivanoff says. The op-eds explain what the federal highway program means to each state’s capital investment program, and are customized with local data about jobs and road conditions. Over a two-week period, the pieces have appeared in the Detroit Free Press (Sen. Stabenow-D), Utah’s Deseret News, (Sen. Hatch-R), New Jersey Star-Ledger (Sen. Menendez-D), Harrisburg’s Patriot-News (Sens. Toomey-R and Casey-D), Albany’s Times-Union (Sen. Schumer-D), South Dakota’s Rapid City Journal (Sen. Thune-R), and Des Moines Register (Sen. Grassley-R). ARTBA has more strategically media outreach planned in the coming months. To stay up-to-date on the latest transportation related news, follow us on Facebook, Twitter, or Linked In.